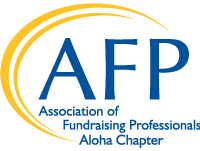 AFP Aloha Chapter believes that the organizational culture that embraces diversity and inclusion creates a strong, vital and unified force for the effective pursuit of its mission and fundraising success. Diversity and inclusion for this chapter will be achieved with a broad representation of its membership with regard to experiences, perspectives and cultures. In order to ensure that the best possible thinking, opportunities and solutions are considered in its management and its intention to create a respectful and welcoming environment that is open to all, this chapter will seek to include individuals and groups from Hawaii's diverse cultural, generational, religious and other identified groups. THEREFORE BE IT RESOLVED THAT AFP Aloha Chapter is committed to diversity as an ongoing proactive process in its governance, committees, membership, programs and activities.